Complete all required hours (Workshops/Seminars/Clinical/Internship/Computer Classes). All eligible graduates must complete the online registration form and bring it to your campus before 4:30 pm on Friday, March 15, 2019 to participate. Click to complete and print out the online registration form. Registration fee is $65 and includes Cap, Gown, college pin, diploma cover, and 4 tickets. Registration fee for graduates with Perfect Attendance is $35 and includes Cap, Gown, college pin, diploma cover, and 4 tickets (sign-off by Campus Director required). Should the graduate fail to meet participation guidelines prior to Friday, March 15, 2019, registration fees will be applied to the next scheduled graduation ceremony. 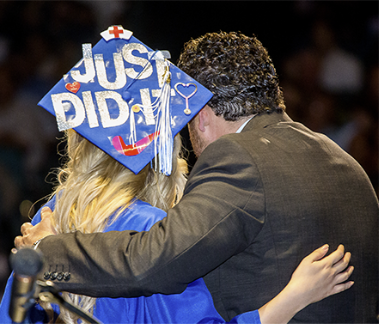 Pick up your cap, gown and tickets on Wednesday, March 20 at the GCC Cap & Gown Expo. The Expo will be held from 11am - 2pm. Please contact the campus if you have questions or cannot attend the Cap & Gown Expo.